Clinical or translational science is the field of study devoted to investigating human health and disease, interventions and outcomes for the purposes of developing new treatment approaches, devices, and modalities to improve health. New molecular tools and diagnostic technologies based on clinical and translational research have lead to a better understanding of human disease and the application of new therapeutics for enhanced health. 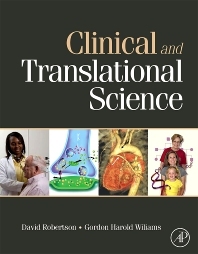 Clinical and Translational Science is designed as the most authoritative and modern resource for the broad range of investigators in various medical specialties taking on the challenge of clinical research. Prepared with an international perspective, this resource begins with experimental design and investigative tools to set the scene for readers. It then moves on to human genetics and pharmacology with a focus on statistics, epidemiology, genomic information, drug discovery and development, and clinical trials. Finally, it turns to legal, social, and ethical issues of clinical research concluding with a discussion of future prospects to provide readers with a comprehensive view of the this developing area of science. Dr. Robertson graduated from Vanderbilt University in 1969, with a B.A. in Germanic and Slavic Languages. He attended the Arnamagnaen Institute in Copenhagen, Denmark before receiving his medical degree from Vanderbilt University Medical School in 1973. He went on to complete an internship and residency in Medicine at Johns Hopkins Hospital. Robertson was a postdoctoral fellow in Clinical Pharmacology at Vanderbilt for two years before accepting a position as assistant chief of Service in Medicine and instructor in Medicine at Johns Hopkins in 1977. In 1978, Robertson returned to Vanderbilt as assistant professor of Medicine and Pharmacology, became an associate professor in 1982, then rose to professor in 1986. He spent one year as a visiting professor in the Department of Molecular Endocrinology at National, then served as a visiting professor in the Department of Anatomy and Embryology at University College in London. In 1993, Robertson became director of the Medical Scientist Training Program at Vanderbilt University and also took the position of director of the Division of Movement Disorders in the Department of Neurology, which he held until 2000. Along with his current roles as professor of Medicine and Pharmacology and professor of Neurology, Robertson is currently the Elton Yates Professor of Autonomic Disorders, director of the General Clinical Research Center and director of the Center for Space Physiology and Medicine for Vanderbilt University. Robertson currently serves on the Board of Advisors for the World Life Foundation, the NASA Microgravity Human Research Committee, the Merck Advisory Board, and the editorial boards of American Journal of Medicine, Autonomic Neuroscience and Clinical Autnomic Research. He is also associate editor for the Journal of Pharmacology and Experimental Therapeutics. Dr. Williams’ group’s first major goal is the identification of the genetic underpinnings of endocrine factors related to cardiovascular (CV) risk in hypertension and diabetes with the ultimate goal of using genetic markers to develop individualized, personal treatment programs for patients with these diseases. His is a translational research group with interdisciplinary focus in humans and at the bench. The group's major focus in human studies is on careful phenotyping of patients with hypertension and diabetes relative to cardiovascular risk factors. The research focuses on evaluating hormones that can modify vascular contractility and/or salt handling. The major current thrusts are the renin-angiotensin-aldosterone system (RAAS), kallikrein, cortisol, adducin, the beta-2 adrenergic receptor and ion transport systems. The second major goal is to determine the role of aldosterone in producing CV disease at molecular, cellular, organ, whole animal and clinical levels. Recent studies suggest that aldosterone has a wide range of effects including inducing microvascular ischemia, thrombosis, fibrosis, and inflammatory responses many of them potentially mediated by aldosterone’s interaction with caveolins and two recently discovered proteins---striatin and lysine specific demethylase 1 (LSD1). Techniques employed include whole animal physiological studies using normal animals, those made hypertensive and those genetically modified (e.g. knock-outs and transgenics). Molecular and cellular techniques include gene arrays using chip technology, proteomics, confocal microscopy, electrophysiology and in situ hybridization. Finally, the group has just begin the first proof of concept clinical trial for using genetic information to provide personalized medicine.